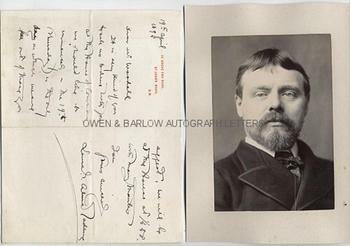 SIR LAWRENCE ALMA-TADEMA AUTOGRAPH LETTER Signed. ALS. 2pp. 17 Grove End Road, St. John's Wood, N.W. 19th April, 1892. 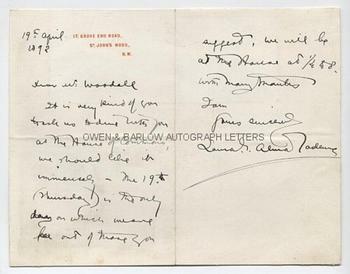 To [William] Woodall M.P. Together with a very fine contemporary portrait photograph. "It is very kind of you to ask us to dine with you at the House of Commons, we should like it immensely - the 19th (Thursday!) is the only day on which we are free out of those you suggest. We will be at the House at quarter to 8. With many thanks." 12mo. Approx 6 x 4 inches. Mounting traces on verso, else fine. 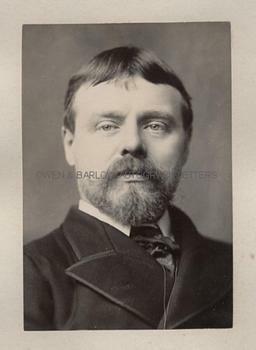 The photograph is a contemporary gelatin silver print measuring approx 6 x 4 inches (excluding mount) laid down on part of the original card leaf of album. Mounting traces on verso of card, else fine.